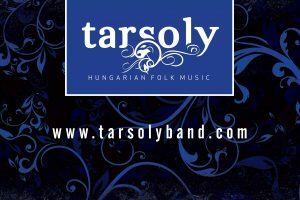 The Tarsoly Band was formed in 2010 and it is composed of 23-28-year-old young musicians. Since some of our members come from the region along the Galga River the folk music of this region became the starting point of our work together but other dialects of the Hungarian-speaking territory are equally in our repertoire. In the founding year of our group we won a special prize at the folk music competition in Tápiószentmárton and a Nivo-prize in Bonyhád. In 2011 we came in fourth place out of 50 contestants at the talent show called Folkbeats. That same year we released and toured with our first record entitled “On a Saturday Night”. In 2012-13 we played for the Hungarian State Folk Ensemble on its guest performances. In 2012 our cooperation with the river cruising company Avalon Waterways developed a new side of the band and further broadend our experience. In 2013 we got into the semi-final of the television talent show in folk music and dance called “Fölszállott a Páva”. That was the year when we launched our cooperation with the Szilas Folk Dance Ensembe and have since then achieved outstanding results and qualifications in numerous folk festivals. In the summer of 2015 and 2016 we were honored to be the official musicians in rehearsals and dance houses of the summer camp of the popular television talent show “Fölszállott a páva” (The peacock takes its perch).2015 marked the beginning of our cooperation with the Bartina Folkdance Ensemble with whom we continue to represent and promote Hungarian culture.In 2016, we won an award of excellence at the Folkdance Festival of Szekszárd. We our devoted to continuing to build the good reputation of Hungarian culture in Europe and beyond.